It was my birthday over the weekend, and instead of some good beef or other food splurge, I made some fried chicken as the anchor dish for my birthday dinner. A weird choice, I know, but I was just in a fried chicken kind of mood. Not a highly battered KFC style chicken (or its wannabe McDonald’s, Jollibee and other fastfood versions), but an Asian style fried chicken with color, flavor and verve. 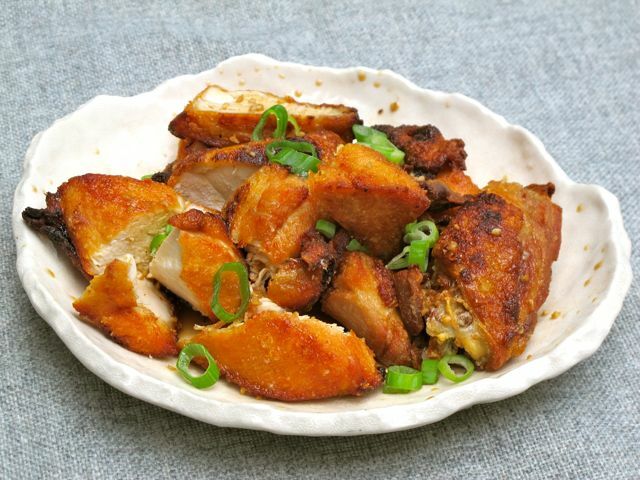 At its simplest, it would be the marinated chicken parts (in soy sauce, of course) simply fried in (usually) used vegetable oil that we used to eat as kids when there weren’t many fast food chains yet. It would be deeply tanned compared to the paler commercial versions. It would be decidedly Asian fried chicken. A few months ago, while testing recipes for the restaurant, one of our cooks made a wonderful version that I really liked. But I think I was vetoed by the rest of the panel who opted for the heavily battered version, deep-fried in lard. The latter was okay, but it wasn’t a slam dunk, and judging by customer reactions, I think we should have gone with (MY) gut instinct and opted for the more pinoy one, closer to our own roots and vibe. I will fix that in the weeks ahead and revise the fried chicken recipe. So I have been on the hunt for a suitable version, and while this particular one of David Chang takes it a bit North Asian to Japan, I really liked the early test results we did last week (photos here from trial one) at home. It isn’t a complicated method at all, and the flavors of the sauce are everything I really like. But the recipe will be tweaked to take into account local chickens, flavor profiles, etc. 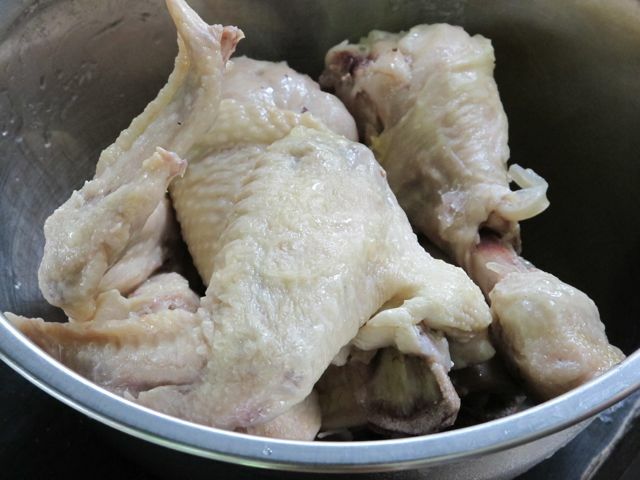 Next the chicken pieces are deep-fried in vegetable oil, we would use our wonderful homemade leaf lard, until golden brown and really appetizing looking. The skin gets blistered and crisp in just 5-7 minutes, but the chicken meat is meant to stay rather moist (though on trial one it was a tad dry). The nice color is apparently partially a result of the sugar that was in the brine and has settled on the meat’s surface, only to transform and caramelize once it hits the hot lard. 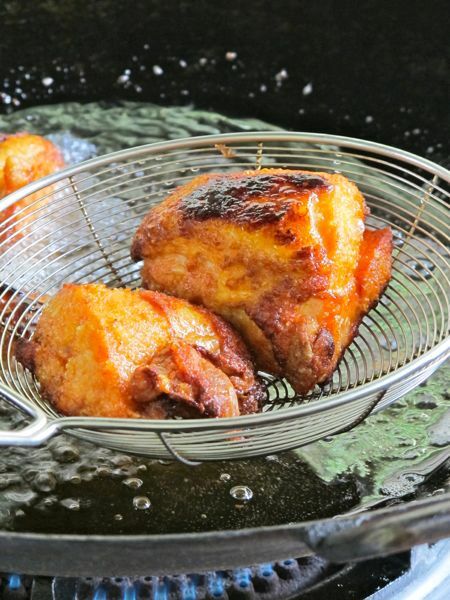 Drain the fried chicken pieces on paper towels and let them rest for a couple of minutes. Then slice into smaller pieces and douse liberally with what Mr. Change refers to as “octo-vin” or octopus vinaigrette, a mixture of ginger, garlic, chilies, vinegar, soy sauce, sesame oil, sugar and seasonings. It’s very Japanese, and similar to what is served with bite-sized pieces of fried chicken in many Japanese restaurants. It’s good. And perfect to dunk crisp pieces of chicken into or to add to one’s steaming hot rice. Yum. …but don’t the pieces look good? I personally think these are much more appealing than the batter coated chicken pieces filled with MSG and gosh knows what else. Here a photo of me trying to figure out my new camera and taking extremely close-up shots. It’s a Canon EOS600D with a macro lens. The photo of me taking the photo was taken with a CanonG12, which I can bring with me almost everywhere without much hassle. P.S. If you are looking for a post on battered fried chicken, try this old one that I wrote nearly four years ago. Looks very good! Just a question, does brining also involve sugar? I’m not really so keen on sugar. YUM!!! Awaiting for the tweaked version to appear on Zubuchon’s menu. I like fried chicken more if not battered and I prefer dark meat not white meat, I love the skin that is why I don’t like it when my aunt removes the skin because she always says too much cholesterol. That is why the chicken she cooks lacks the “IT”. I have seen that brining method that you do in America’s Test Kitchen and the result looks very good. I will try that octo-vin sauce one of these days because I, too use ketchup. It might change the equation if you take some ideas from Keller’s breaded fried chicken which is excellent. A quantum leap from KFC. I am doubtful about the steaming step in Momofuku’s fried chicken although I heard that that was Max’s trick too but you do not want to aline your fried chicken with Max’s just for the plain reason that it has been done. That’s some beautiful fried chicken! :) So I’m glad that barring the longer time investment, this is definitely a doable dish for me. I’m surprised too because I had the impression that the Momofuku cookbook holds recipes that are “labor intensive” & exacting. Even the sauce does not require a trip to a specialty store. Thanks for sharing this, MM. Belated happy Birthday, MM! You mentioned sugar-salt brining, how long should the chicken be in the brine solution before I steam it? I will have to try this recipe . As always, thank you. At home we always cook whole fried chicken Max’s version. With Jufran Banana Catsup of course. Yum. But will definitely try your version MM! Btw, nice expensive camera you got! Belated happy Birthday, MM! You mentioned sugar-salt brining, how long should the chicken be in the brine solution before I steam it? As always, thank you. I actually have a whole chicken thawing in the kitchen sink. I can’t promise I’ll do the whole process, maybe the brining and steaming but not the deep frying. But then again, I think I’ll make pansit na lang dahil birthday mo pala MM—pampahaba ng buhay! Why don’t you just use chicken thighs to prevent dryness? It’s less healthy but it will definitely yield much better results. The meat on the chicken looks fantastic. I’ve always had a problem with pinkish meat on chicken. And yours is white and plump to perfection. The skin looks nice and crunchy too. Can’t wait to taste the final product in the resto! belated happy birthday Mr. MM. i think i saw you last saturday @ the salcedo weekend market. would have wanted to have a photo op but thought you might not like it so i just took a glance. can i have a photo op with you the next time i get to see you? i just want to have a collection of pictures taken with my favorite bloggers. MM, I’m not too familiar yet with brining and I might put in a tad too much salt or sugar – do you have an exact measurement for this? I remember as a kid, there was a step popularly used then which was bathing the chicken in sprite or 7UP. Btw, belated happy birthday MM! The photos in this post looks so yummy! I have an aunt who cooked fried chicken without any coating of batter, and it’s always a hit with the family. And she preferred the darker meat over the white meat. Too bad I was too young to ask about the recipe when she was still alive. Thanks for the tip, can’t remember where I got this info but some restaurants I understand are pressure cooking, I guess for the timing and all. Happy birthday and congratulations on the resto.. Ohh on another note, remember the investment project how is it faring now that we are going through a second crisis or is it the aftershock of the first. Instead of steaming the chicken, wherein there’s a chance of overcooking it, you can probably bring the brining solution to a boil, turn it off, and then drop in the chicken and leave it there to steep? This will cook the chicken but not enough to dry it out. I thought so, too, MM. It will be a nasty piece of work after the steaming. I also couldn’t find a decent steamer here in my house but I thought of using my fish kettle! I can have the chicken in there and steam some other things. The bird is now brining nicely with some old raisins I found in the cupboard. Now I have to think of a dip…or sauce…or both of them! Check out http://www.trissalicious.com for the same David Chang recipe. She used a high tech gadget called a thermomix to make this dish. Will this steaming method works also for a whole chicken? I wanted to deep fried a whole chicken, and I have tried it before, pero yun na nga, hilaw ang loob. I then tried cutting it in half, medio ok, pero ganuon pa rin. keep it simple but use the freshest ingredients. My moms recipe is a simple kosher or rock salt but I think the secret lies in the chicken she use. During those time live white leghorn chicken are widely available in the market which is quite tough if you fry directly in oil. That is why She’ll boil the chicken in a bit of water till tender then deep fried. I did try the same step on those supermarket chicken now but I can’t duplicate the taste. Although I do have success on native chicken here. I do believe the chicken makes the difference. i made this and followed directions to the letter from how to cut the chicken to brining then frying. I cut the chicken to 4 pieces and fried the 4 large pieces, cutting the portions after. It was very moist. the octo vinaigrette is fabulous. i do one part sugar and one part salt no matter how much or less the water is. the chicken should be completely covered in water and brine overnight in the fridge. it works all the time. i hope this helps! Belated Happy Birthday MM! Many more years to come… it just gets better! Thanks for sharing this fried chicken recipe. It is a lost version of fried chicken. People have forgotten how tasty and delicious fried chicken is without the batter. I do miss this and am suddenly craving for it now. Hahaha, everytime you post a blog it just makes me want to make it. One day, I will. Hope to meet you or see you when I set foot in Cebu soon! Belated Happy Birthday MM! This is my first time to comment,just got an idea on my way home from work. Have you ever considered on venturing on a tie up with a courier co. to distribute your	food products outside Cebu for readers like me who wants to try your fabled zabuchon but does’nt have the opportunity to visit your resto. Im quite confident that most potential clients wont mind the extra cost, just dont forget me when this become a success, hehehe. Just my two cents worth. Godspeed! Kai…in this day and age when antibiotics are freely used though not necessary at times, there are dire consequences which farmers are not really aware of. A consumer reporter did her thing here and investigated the free use of antibiotics on poultry after a lot of people showed up at a local hospital needing medication via IV for they developed the BUG resistant …new strain stemming from eating antibiotic laced poultry over time. After seeing that show I shudder to think I fed my family this and one day they will develop the same thing. Sad part is the reporter confronted the head honcho of the poultry assn. and he couldn’t give a straight answer to her though he was given the results of the microbiology tests done. In a few years, hubby will retire so I told him that I would like to move to the country and raise my own chickens, vegetables but I draw the line at pig raising! I will just buy them from the neighbours. Can’t blame you Betty Q. Just be sure your neighbor does not sound and act anything like Pickton. For non-Canadians, he was our modern day counterpart of Jack the Ripper but fed his victims to his pigs. @MM, I strongly recommend the Keller recipe. Probably the best Western style fried chicken I’ve ever had. My wife adds a special touch though, she adds a bit of duck fat to the vegetable oil. OMG! It made an already very good fried chicken to something spectacular! Hi bettyQ:	Yes, every time I go to the grocery store and see those humongous chicken parts , I think of steroids, antibiotics and all the growth enhancers for this most eaten source of protein….all the more reason to go vegan on certain days and buy free range and organic meats. Come to Puerto Princesa and we’ll have organic chicken and pork from the organic farms nearby and it won’t break our food budget. And we have to warn MM about our Cebu trip for our zubufest. OH, yeah…forgot about him, Footloose! I wonder if he has become a vegetarian?!? I have friends who work at the place he now calls HOME! I will ask them if he has become vegan! Thanks, Stewart for the heads up on that place. …will have to check it out as soon as I can. 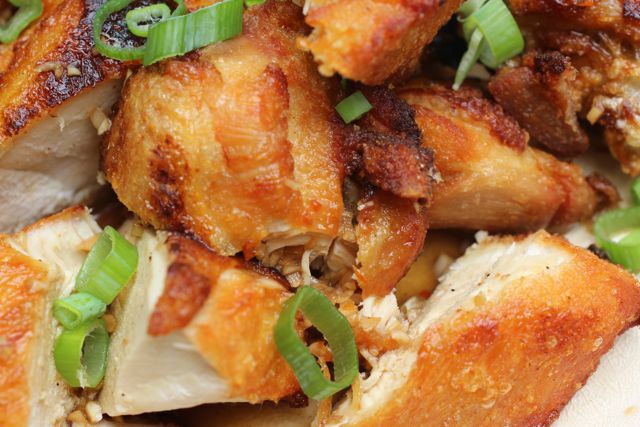 MM, my husband and I tried this fried chicken recipe last night and we loved it! We were a little short on time so we weren’t able to marinate it long enough but the results were already satisfying. Thanks for sharing! Thanks for sharing the results of your recipe trials. I learned how to brine after reading a few of your earlier posts. I sometimes poach the chicken in the brining solution until its partially cooked before frying. The results are good, but you have to be careful not to cook the chicken during the poaching process. 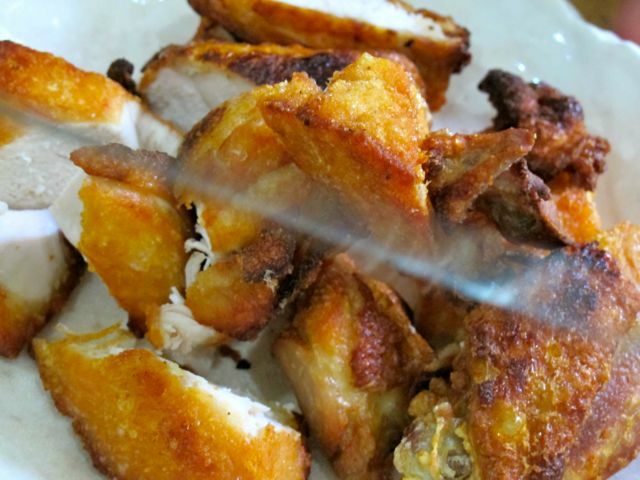 L wonder if anyone has managed to replicate the old Savory Escolta fried chicken, with its wonderful 5 spice powder background taste; I understand that current Savory Mall chickens are not flavorsome all through the meat, but only at the skin. 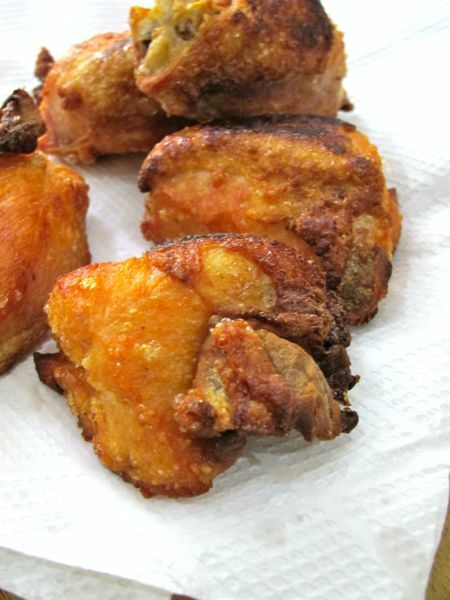 I wonder if anyone has managed to replicate the old Savory Escolta fried chicken, with its wonderful 5 spice powder background taste; I understand that current Savory Mall chickens are not flavorsome all through the meat, but only at the skin. Get a tripod marketman, less shakes. Looks a bit dry to me. I’m a dark meat kinda guy and really don’t like the breast parts because they’re usually very dry. Except maybe for hainanese chicken. Also want to give a thumbs up for Thomas Keller’s buttermilk fried chicken. Had some last year at Ad Hoc. Best tasting fried chicken I’ve ever had. The outside was crispy and the inside was very juicy. A bit pink in the center but it wasn’t “gummy/chewy” (the way raw/undercooked meat feels like texturally) and was very tender so I think it was thoroughly cooked in spite of the color. Belated happy birthday MM. The chicken looks good!! Can’t wait for the detailed recipe so I can try it myself. Hi EbbaBlue, yes, steaming whole chicken works. Just prick the part where the thigh meets the lower part of the breast and if the juice runs clear, that should be ok. My Mom taught me to put parsley or coriander, garlic and bay leaves in the steaming water to perfume the chicken, make it tastier, and she said it helps the meat to stay moist (not sure if the last one is true but I have always had moist chicken so maybe it is – Mommies know best, afterall). 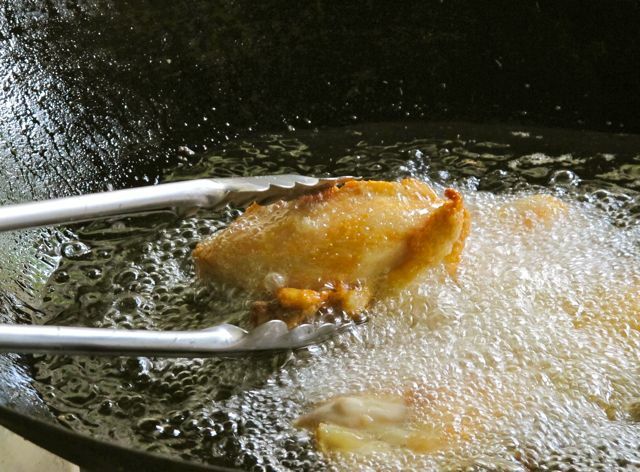 I just slather the steamed chicken with patis, deep fry the entire piece and viola, a better version of Max’s! @MP, Sounds similar in flavor, but no steaming. One of the most remarkable fried chicken I have ever tasted was off the street of Thailand. Found out later that they were marinated first in a mixture comprised mostly of pounded cilantro root and stems and patis then lightly dredged with rice flour to give the pieces of chicken a truly cracking crunch. 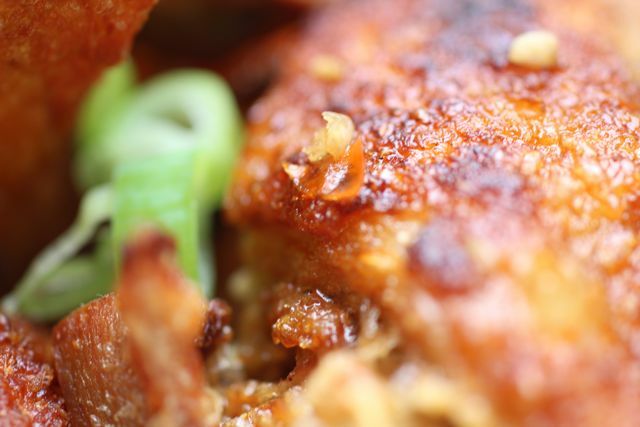 But back to basics, our fried chicken that is simply marinated in light soya sauce and calamansi juice can hold its own. Mother ran the kitchen of the small hotel she operated with my dad in Cagayan de Oro and the last guests they served before they evacuated were a group of Australian army officers that was in the tail end of the same convoy that took MLQ to Australia. They asked for fried chicken and mangoes alone and that was what mother served them, under lights wrapped in lengths of dark fabric since a general blackout was already in effect. A belated Happy Birthday to you MM! Will try this chicken recipe plus the octo-vin! Liked all the photos! I was only able to brine the bird, MM, got a terrible migraine attack out of the blue so I skipped the steaming part and couldn’t do the deep frying. So I spatchcocked the chicken then flavoured with sea salt and pepper and a little massage of butter then laid it on chopped carrots, onions and pears plus a bouquet garni of fresh tarragon from my backyard…I was served the fruits of my labour in bed. Even with just brining before roasting I tasted the difference. The bird was so moist and the skin caramelised. My particular bird tasted delicately of tarragon ;)) Btw, I used one cup of sugar; a handful of salt; a small pack of raisins, 10 pcs. of juniper berries and dried tarragon leaves for my brine and brining time was 5 hours.But here’s the downside, LOLZ, I vomitted my delicious dinner after just a half hour stay in my stomach. Pardon my story, MM, blame it on MM (My Migraine). One thing I learned from this post, it is okay to brine. 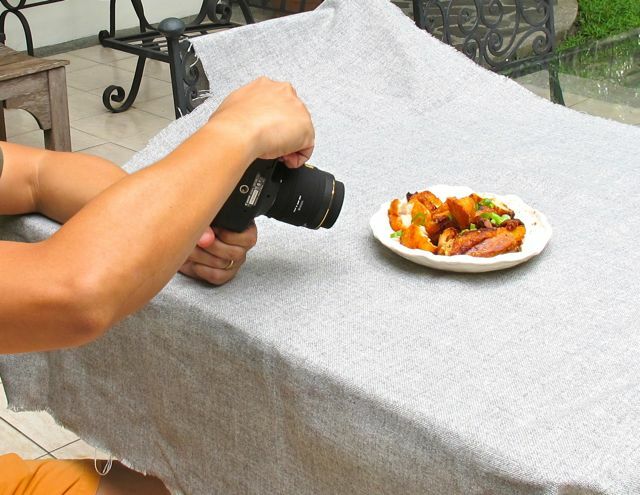 The taste is worth it… I actually have pictures of the whole process (Marketman wannabe) minus the end result…Nah, can’t do MM job— food blogging, photography, travelling, etc. I can’t do intelligent and elegant rants, hahaha!!! That fried chicken looks fantastic! Unfortunately, fried chicken is just one of those things that I can never seem to get right. Every time I try it the chicken either ends up way over cooked or bloody raw inside. Anyway, I answered your chicken poll with Asian style chicken, but in reality I love it all – KFC, Popeye’s, old-school Filipino homemade, Max’s, Bon Chon, black (er… soul food? ), white, Korean, Chinese, Japanese… lol. Fried chicken is just one of my all-time absolute favorites. I’m not a big fan of battered fried chicken. I like it simple, brined chicken ( like I do my turkey before roasting), chicken marinated in soy sauce & calamansi (with a dash of sugar) or chicken marinated in calamansi & patis. yum! KETCHUP please. Love G12.. but i use mark5 ii for my blog and I own a macro lens.. Hmm we had a bbq few days back and I have been asked what marinate I used.. hello from Patmos, Greece. Footloose, thanks, I think ‘ll try that Thai fried chicken version – I’ve always liked it but never got around to asking what they marinated it with. I hope you don’t mind my asking, are your parents from CDO? @MP I don’t mind at all. They were there till right after the end of WWII though we still have a lot of close connections with the place to the present. Mother has a family connection with Emmanuel Pelaez’s family for example. 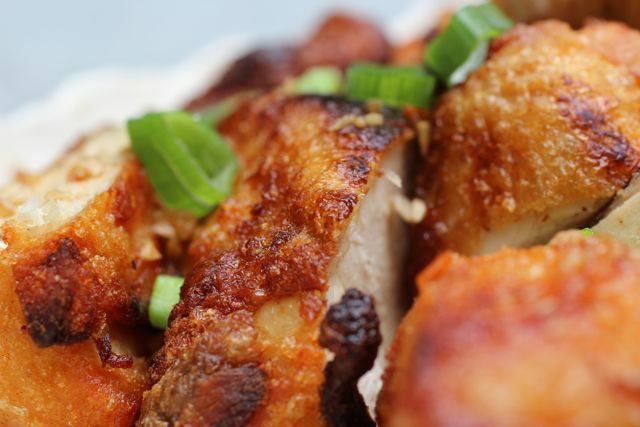 wow this fried chicken recipe reminds me of how my aunt makes her famous fried chicken! the brine water constitutes rock salt, about 6 inches of sugar cane hammered down, laurel leaves and whole black peppercorns. She packs a huge wide-mouth garapon/banga with spring chicken (about 4-5 chickens) and then pour her cold brine water over. The chicken stays submerged in the brine overnight. Then she dries the chicken and then use the same recipe for the brine to use as steaming liquid. Some times we can’t wait for her to fry the chicken, we just get one of the steamed chicken and eat it with white rice. yum! I love eating chicken, more so the “native” variety but since the meat is tough, we often end up making either adobo or tinola with it! The taste is so much better than the commercially availabe chickens but adobo or tinola every week gets old sometimes. This will be another way that I can enjoy the chicken, hopefully the brining and steaming can get rid of the toughness.I can’t wait to go home and try this out. Thanks for the recipe! thank you so much for a lot of info about cooking and prviding us recipes. i learn a lot from you. @footloose: I tried Chez Pim’s recipe and I loved the crispiness of the chicken. Cooked it already twice for my guests and it did not disappoint. Footloose, I’m from a neighboring city. What a thrill to know that you are related to the Pelaezes. My daddy was a friend of EP, actually an ardent admirer of EP. He kept saying that if we had more people like EP in the government, the Phil would be a better country..
Footloose, so six degrees of separation… My mother in law’s (+) first cousin was Tito Maning’s wife. Tito Maning was present at our wedding nearly 19 years ago… And my dad was the VP’s campaign manager when he ran for President, losing out to Marcos who go the party nod instead ( I think I have the politics right…). Have to honestly admit that I have not cooked fried chicken since I handed over my shop to the new owners seven years ago. Was impressed by Keller’s that I tasted at a cooking friend’s backyard but not even sure if I should test Chang’s unbreaded before SheSimmer’s Thai rice powdered fried chicken recipe (h/t Betty Q). Meanwhile, I have been filling the void in Chinese restaurants here where their crispy fried chicken never fails me. Or else on Tuesdays, KFC has a promotion they call Toony Tuesdays. As you know, loony is what we fondly call our Canadian dollar coin on account of the image of a loon on the flip side of the profile of the Queen. A loon is a native water fowl with a hauntingly sad call specially when heard at dusk. When the two dollar coin came out, it was quickly dubbed the toony. Anyway, you get two pieces of the fried chicken of your choice and some fries for a toony, any additional piece or a drink for another loony each. Slight draw back for those concerned maybe those forming a line do not seem like a tony crowd. The best fried chicken I’ve ever tasted was in Indonesia at a restaurant called Ny. Suharti which serves Yogyakarta style fried chicken. It’s so kakaiba, I can’t even begin to describe. 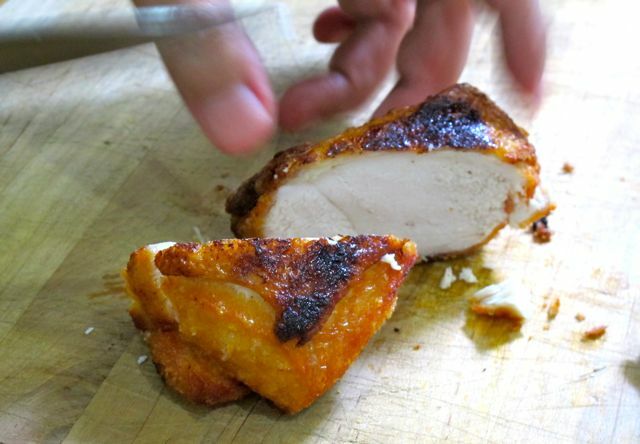 It’s got like this crumbly, flaky flavorful coating and they use only native chickens. I’m being completely useless and inarticulate, I know, but seriously, it’s worth a trip to Indo just to try it. MM, I cooked this fried chicken for my family’s dinner tonight and they loved it so much. I followed your steps and made my own proportion for the brine and for the “Octovin” sauce. My kids would like to have it for dinner again tomorrow. Many thanks for sharing. Actually, I have been trying some of your recipes in MarketManila and its always an instant favorite for my family. My family had eaten in your Zubuchon @One Mango on its second day of opening and my entire office staff had lunch in your Zubuchon@Escario on its second day of opening too. I hope to try your friend chicken in both restaurants soon. THANK YOU… so much imparting you skill and knowledge in terms of assorted menu…Again thank you for sharing this menu..